Precision milling machines ranging in size from 800mm x 600mm x 400mm to 8000mm x 2000mm x 1000mm including both CNC and manual controllers. 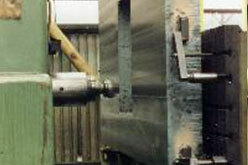 Tool room lathes from 180mm (dia) x 1000mm (LG) to 770mm (dia) x 3000mm(LG). Both CNC and manual controllers. Vertical Borer 1830 (dia) x 1220 (H). 5000mm slideway grinder (floor type). 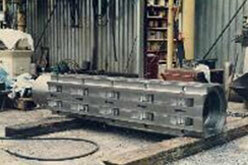 Surface grinders 150mm x 300mm to 1200 x 500. Radial arm drill with pit. 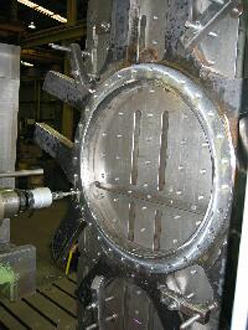 Jig boring and tapping heads (variety of sizes). Two 16 tonne overhead cranes (32 tonne on two hooks). 940 Square meters of machine shop floor space. Crib Point Engineering have onsite milling machines, to accommodate projects that are not able to be shifted (IE, cast in plates, large machinery). Crib Point Engineering have many custom platforms and mounting systems to allow fast adaptation of our machines to your site work. Robot cell indexing frames being machined.